When I was 13 and away at summer camp, Gramma Kenyon wrote me a letter. I remember the morning mail call, when the camp counselor called my name and everyone gathered around to hear the news from home. “Your mom had a baby girl,” Gramma wrote. In her own great way of storytelling, my gramma told all the details about my mom chasing cows from the back garden in the rain the day before. I could hear my gramma’s laugh as her words came to life on the paper and I read them aloud to my new friends. A few days later, when my mom brought my youngest sister, Lori Beth, home from the hospital, my brother, David, decided to run away. He packed his suitcase and got as far as the end of our long street. He didn’t want to be the only brother in a house of three sisters. My college roommate and I exchanged letters the summer before we met, just before orientation. We wrote about our likes and dislikes, what we could each bring to furnish our dorm room, and our hopes for the future. Our close friendship grew from that first letter, traversing weddings, births, bat mitvahs, late night talks, loves and losses, bowls of ice cream, and many more addresses, stories, and letters. 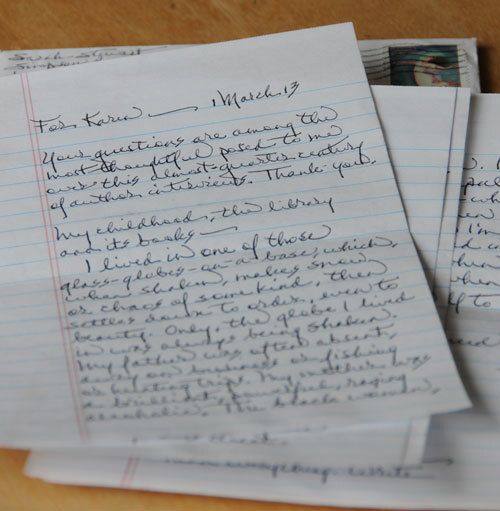 When I interviewed Sarah Stewart this spring, she shared wonderful stories about her life in a handwritten letter to my slow address. As my Aunt Marion’s children grew up and left the house, she began mailing each of them a letter every Wednesday. 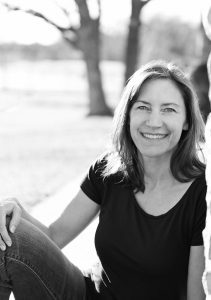 She wrote about her “word of the week,” a seemingly random word from the newspaper or a book or a conversation. She wrote the dictionary’s definition, then added her own thoughts about how that word might be used in their life. My cousin Justin keeps his mom’s letters in a box. They are, of course, about more than a word or a life lesson. Over the course of Bob’s deployments with the Marines, we exchanged more than 800 letters. He taught me to notice and appreciate the smallest details so we could share our days with each other even when we were an ocean apart. One day, those same letters will be a gift for our son to know his dad, who died when he was only three. His dad’s personality will unfold by his own hand, through the neatly printed letters, the humorous drawing of his make-shift oil drum toilet in the desert, his sense of duty and love of his country in his descriptions of the people he served with, his frustration and intelligence surrounding the politics of his situation, and his unwavering love for a certain girl back home. My memories of my own father include his signature, an image as clear to me as his smile. His drawing of our dog, Skip, is as deeply rooted in my mind as his voice. My dad was a man of few words, but because he hand wrote some of those words for me, I can see him in the loops and slants of his scribbled notes. About seven weeks before our wedding, Geno and I attended a marriage retreat. One of the exercises was to write each other an impromptu love letter. Geno’s handwritten love note to me is one of my favorite things to read and reread. It is raw and honest and vulnerable and tender. I’ve seen letters mend friendships, express thanks, forgive the most difficult trespasses, welcome new members of a family, hold grief’s hand, and give a gift of unending presence. This month, I was asked to participate in the Books Make a Difference mom bloghop, to write about the difference books and blogs have made in my life. But as I considered Meagan’s request, I realized it is the blog’s predecessor, the handwritten letter, that has made a profound difference in my life for as long as I can remember. I’ll continue to be inspired by books (on my nightstand now: The Invisible Bridge by Julie Orringer, a gift in the mail from my friend Jenny; a novel in which, BTW, letters play a key role in the story). I’ll continue to read and write blogs. I’ll continue to send love notes to my husband via text. But my favorite will always be the handwritten letter. 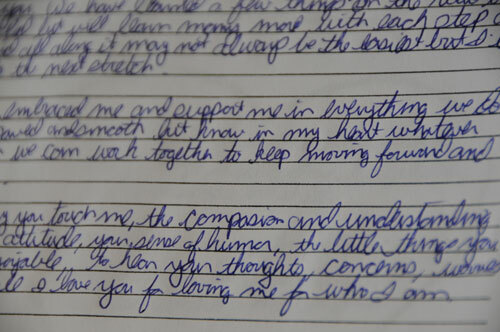 When you write long-hand, your brain slows down in time with your heart, opening it just a little deeper. And it is there, in the midst of that deep-heart handwritten note, I have found love and heartache, friendship and self-discovery. Yes, I am partial to handwritten letters. And to the people in my life who’ve taken the time to write them.